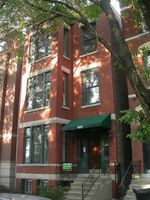 FANTASTIC OLD TOWN LOCATION- 2 BEDROOM/ 1 BATH. HARDWOOD FLOORS, UPDATED KITCHEN, PRIVATE OUTDOOR SPACE IN REAR, FREE LAUNDRY IN BASEMENT INCLUDED! GARAGE PARKING AVAIL $150/MO. NEAR NORTH/WELLS NIGHTLIFE AND TRANSPORATION BUT ON QUIET RESIDENTIAL STREET. THIS IS ONE OF THE VERY BEST LOCATIONS IN OLD TOWN.